Graduate shows 2015: tiny turbines installed in the arteries of genetically modified cows provide a solution to future energy production in this fictional scenario by RCA graduate Paul Gong. The Cow of Tomorrow project, created by Gong while studying on the Design Interactions course at London's Royal College of Art, imagines how dairy cows could be used to provide both milk and energy. "The Cow of Tomorrow describes an extreme future use of animals, taking notions of utility and domestication to a logical end," said Gong. His starting point was to re-design the dairy cow – an animal that has already undergone generations of industrial domestication. 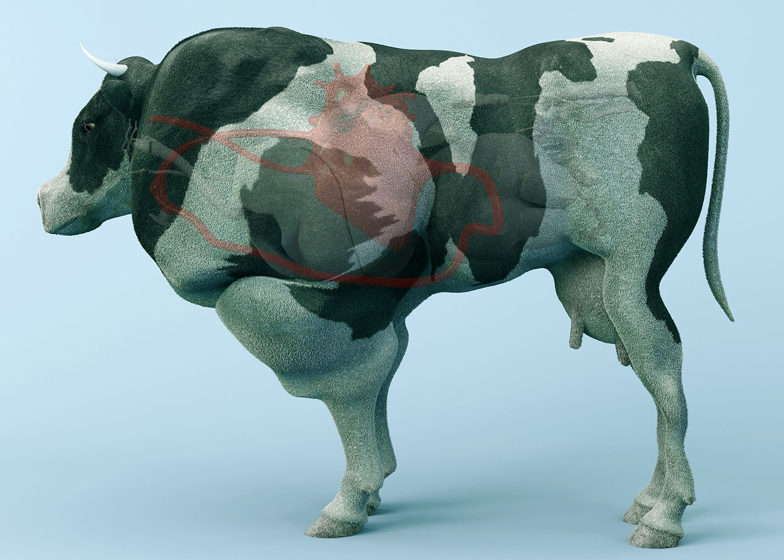 Gong proposes altering the cow's physical form through synthetic biological procedures so it can accommodate two hearts. "My project considers utility animals, where we explore animals for human benefit rather than something as simply for companionship," Gong told Dezeen. He stumbled upon research by Swiss biomedical engineers, who published their findings in a 2014 paper, which considered whether blood flow could be use to power a turbine for a pacemaker so its battery wouldn't need changing. This led to the idea for inserting miniature turbines into a souped-up cow's oversized circulatory system, which could generate energy that might somehow be extracted and consumed as electricity. Both hearts, one slightly bigger than the other, are larger than a normal cow's single blood-pumping organ. The two would be also connected by an extra artery that would contain the turbine, which would also be modified from the Swiss scientists' proposal. "The re-designed vascular turbine is twice as long as the original one so that it is more efficient at producing energy," said Gong. The designer suggested "borrowing" a surgical procedure used for cannulation – inserting a medical tube into the body, often to deliver or extract liquid – to administer the turbine in the artery via the cow's stomach. The cow would also have larger lungs to provide more oxygen needed for the larger circulation system, but the rest of the organs that are less important for human needs would be shrunk. "This project explores how emerging technologies facilitate man's attempt to increase our control over nature, and if that would be for the better or worse," said Gong, who has previously imagined how synthetic biology could be used to modify the human body so it can consume and digest rotten food. Although the dairy cow was the focus for this project, Gong suggests it could also be applied to other animals. "It might be that other animals like dogs could be involved in this system," he said. "In the end it might be humans as well. A short story that accompanies the project was written by fellow RCA graduate Debbie Ding, and a booklet outlining the idea was created by graphic designer Willa Hsiang. The project was presented during the Show RCA graduate exhibition, which took place from 25 June to 5 July 2015, along with a new material made from plant fibres and naturally fermented cellulose. In March, Design Interactions course leader Anthony Dunne announced that he was stepping down from his role at the end of this academic year, along with fellow staff member Fiona Raby. A series of synthetic biology projects have been proposed by Dunne's students, including a concept for harnessing nanotechnology to create foods for feeding the world's burgeoning population and a scenario in which a woman gives birth to a baby dolphin before eating it. Photography is by Lydia Chang.